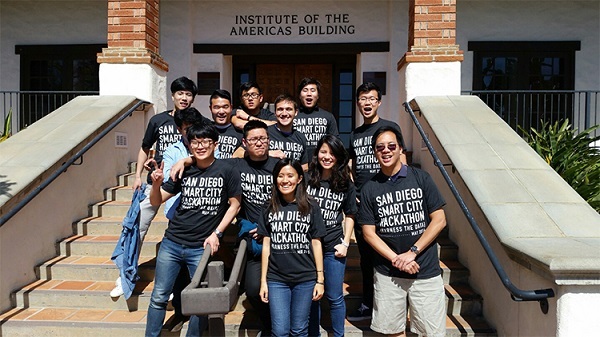 In its daily online report, the magazine reports on the dedication of the Visualization Center at the Preuss School UCSD, funded in part by Calit2, giving middle and high school classes "access to hundreds of advanced (3-D) software programs, including some that will be developed by ...Calit2." In its January 15 issue, the magazine profiles "33 people we have our eye on" among San Diego's movers and shakers, including UCSD Sixth College provost [and Calit2 education layer leader] Gabriele Wienhausen. In its February 2003 issue, the magazine cites Calit2 director Larry Smarr and academic participant Andrew Chien among seven researchers leading the way in Grid computing and peer-to-peer network. In an article on the state's budget, Bill Parker, vice chancellor of research and interim division director of Calit2 at UC Irvine, commends Davis' efforts to advance research claiming, "The governor created a model of commitment to high tech that is the envy of other states." In its annual issue, the monthly magazine names Peter Cowhey, the new dean of UCSD's graduate School of International Relations & Pacific Studies, and his plans "to maintain and enhance the school's role as a breeding ground for future Pacific Rim leaders." Cowhey is the leader of Calit2's Policy, Management and Socio-economic Evolution layer at UCSD. According to writer John Schwarz, "dozens of colleges are going wireless, including.... the University of California at San Diego," creating a challenge for professors as more and more students cruise the Web in class.